David Gaider, Ken Levine, and Chris Avellone Discuss What Matters Most in Games: the Words or the World? This Saturday, at PAX East, I had the pleasure of attending the "Plot vs. Play" panel, moderated by Joystiq's Ben Gilbert and Kotaku's own Jason Schreier. The panel brought together three developers who have all worked on landmark, story-driven games to discuss their differing philosophies on the presence and purpose of story in gaming. 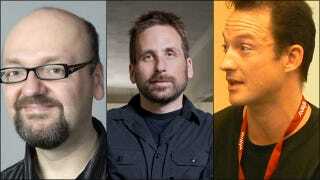 Ken Levine (BioShock, System Shock 2), Chris Avellone (Planescape: Torment, Fallout: New Vegas), and David Gaider (Knights of the Old Republic, Dragon Age: Origins) are all developers on games known for their gripping stories and worlds. And yet, each of the three brings in a very different outlook on the entire point of story writing, and works on games that represent different approaches entirely to storytelling. The differences in core philosophy shone right from the start of the panel, which opened with a short but complicated question: why does narrative matter in games? What it provides that regular media doesn't is the interactivity, right? You can have great stories in a film but it's the level, it's the part where the player is personally invested in their own character and their own story that can bring it up to the next level. There's a lot of talk about whether games are art, and no one seems to question that about a movie or a book, but in games their element of interactivity lets the player be partly an author along with the game's creator and that's unusual, that's weird. And from an outsider perspective that doesn't add anything — that's why there's all this discussion, because they don't see the value for the person who's playing the game, how to them that elevates the story and makes the stakes much higher. I think that's what's important. One particular example that comes to mind is .. Josh Sawyer, who was playing through Fallout New Vegas for the second time. And he decided to piss off both factions in the game, who hate each other. And when you piss off either faction in the game, assassins will attack you, which is pretty typical for showing reputation mechanics in games. But because he had chosen to piss off both factions, which is something we hadn't accounted for, he woke up in the Mojave Wasteland one morning to find that both assassin squads had spawned in but rather than attack him, they launched at each other, murdered each other, and Josh just went by, whistled, looted all their corpses... And I could have spent like a month and a half trying to do a narrative design solution that would set up that situation, but because of the mechanics Josh was able to have a story all his own because of his actions in the environment. I would say that the best tool we have to sell our story is the world because the visual space. I don't have the comfort of being able to tell the story through a lot of words as much because I view that in our games as sort of a 14.4 mode of communication... so the environments are the T3 line. And it gives you so much information that's always there, it's all around you, all these polygons, and you can take in so much more visual information all at once than you can take in audio information. So I don't see it as a right way or a wrong way. I see that for us, we tend to rely upon the environment so much because you can do so much at once, process so much information so quickly. All three continued to discuss the different kinds of stories that games can tell, and how designers can encourage those stories — but they agreed on a fundamental theme. Restriction both for designers and for players is what makes games work. On the development end, necessity is the mother of invention, and resources are never limitless. Each had a story to tell about a time that resource limitation worked in their favor for creation. The New Vegas DLC "Old World Blues," Avellone explained, had come about from being told that there was no budget to create new art assets for the episode. And I think that's true for every game, so really it's all a matter of how well the illusion is maintained. We're setting up those little pieces of crumbs for them to follow, and it depends whether we're setting them in a straight line to lead them to something, or whether we put them in strategic pieces around the level, or we do what Fallout did and just fire the pieces out of a cannon. But it's all a matter of maintaining that illusion from the player, of maintaining that buy-in... The difference between good games and bad games, or good narrative and bad narrative, is how good a liar the people that make the games are. There is, in the end, no one correct way to deliver story to a game's players. BioShock, Fallout: New Vegas, and the Dragon Age series are all successful, well-regarded games with dedicated fans, and all three tell their stories compellingly. Levine, Gaider, and Avellone each cited examples of the others' work as positive and deeply effective. And in answer to one of the last questions near the end, Avellone summarized what all of the panelists' games set out to do: create emotional moments. A successful narrative, in a game, should drive players to feel and react. Let's hurt the player! Let's hurt the player bad. And you want them to feel the pain, but you also want them to love the pain. So for me, it's a kind of contract with the player. They're letting me stab them, they asked me to, and I just want them to thank me afterward. And the best game experiences do, indeed, hurt so good you just can't stay away.